One of the most important aspects of a Delivery system is to notify the drivers with the necessary information. Most if the drivers at A la Carte Express use Nextel phones, some that are rented to the drivers, some that they own themselves. 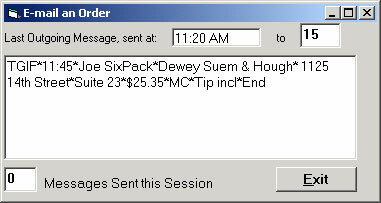 Nextel supports email messages and EmailOrder extracts the information from the order and passes it on to the driver. Unlike PageOrder , a paging based driver notification system and it's predecessor, EmailOrder does not incur Phone charges and is hundreds of times faster. Any other phone that supports email, works too of course.